Quick Ship Item. Also available for Store Pick-Up. Newest model with refined easy to use control panel and upgraded electronics. 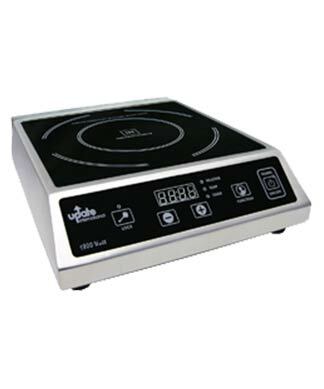 1800w, 120 volt, stainless steel with ceramic top. Push-button operation. 140F - 464F temperature range. Electric Cord length 56". Power Rate: 6 adjustable settings from 500W (watts) to 800W in 300W increments, and from 800W to 1800W in 200W increments (default 1200W). Voltage: 120V - 60 hz. Temperature: 16 adjustable settings. Timer: 40 adjustable settings from 1 minute to 20 minute in 1 minute increments, and from 20 minutes to 120 minutes in 5 minute increments. Safety Auto Shut Off Time: 2 minutes. Maximum weight it can hold: 33 lbs. Size:�15-1/2" x 12" x 4-1/4"